Have you registered and redeemed your NS45 Vouchers yet? National Service (NS) in Singapore began in August 1967 with the first batch of 900 recruits. In 45 years, there are more than 900,000 Singaporeans who have served NS turning them from Boys to Men – with many NSMen who become Fathers, seeing their sons’ turn to serve NS – thus the theme, NS45 : From Fathers To Sons. In commemorating the 45 years of National Service in Singapore, and to recognise the valuable contribution of our NSMen, the Ministry of Defence (MINDEF) and the Ministry of Home Affairs (MHA) are giving out about $100 million worth of benefits to more than 900,000 National Servicemen. They will receive the NS45 Vouchers (S$50 to S$100 in denominations of S$10 each) plus an offer of one year free SAFRA / HomeTeamNS Club memberships for eligible groups of NSmen. Here’s a diagram to explain the total amount of vouchers you will receive and whether you will be eligible for the free 1 year SAFRA Club membership. For our friends from the HomeTeamNS, you can find out your eligibility here. From now till 13th Apr 2013, NS45 Eligibility letters will be dispatched in batches to our mail boxes. We will then need to confirm our mailing address before we receive the vouchers. Existing SAFRA members will get their benefits automatically by post. If you are currently serving Operationally Ready National Service (ORNS) – previously known as Reservist or if you have completed your ORNS training cycle, you will be among the Eligible National Servicemen who will be offered the one year’s free SAFRA membership. The one year free membership will be valid from 1st Apr 2013 (or the date of application, whichever is later) to 31st Mar 2014. 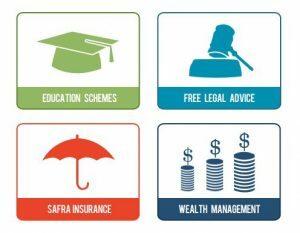 If you meet the eligibility criteria and if you are an existing SAFRA member, your membership will be automatically extended by an additional year. The eligibility criteria will be based on your NS status as at 22nd October 2012. And Permanent Residents (PR) who have served or are serving NS will get to enjoy these benefits too! You can find out if you are eligible online now. Log in to the NS45 website (ns45.Safra.sg or ns45safra.sg – with or without the “.” they both route to the same portal) or Register from this link. During the online registration, you will also get an option to use part of the value from your NS45 vouchers to exchange for a 2 years membership too! You can also register by post (to the mailing address provided in the registration form) or drop the NS45 Registration Form at any SAFRA Clubs. Alternatively, you can also write in through their Contact Us page. If you intend to use your NS45 Vouchers at participating Shopping Malls ie. Capital Malls, Frasers, United Square etc, you will first need to visit the respective mall’s Customer Service Counters to get them exchanged to the mall’s Vouchers, before using them at the retail stores within the mall. However, if the retail shop is already a participating partner (within the Shopping Mall), you can use the NS45 Vouchers directly. 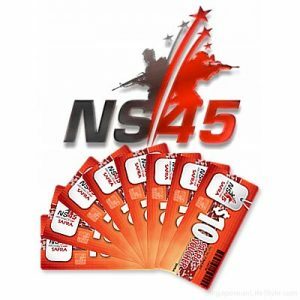 Multiple NS45 vouchers can be used together and it expires at the end of March 2014. However, do note that these vouchers are not transferable and original Photo ID of the voucher recipient must be presented upon request during the redemption. You can find a full list of the Terms & Conditions here. Part of this initiative is to allow for eligible non-members to sign up and experience the various facilities at the SAFRA Clubhouses for FREE – thus helping them to bond by bringing them closer together with their Families and Friends! 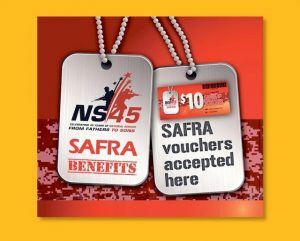 For those of you who are eligible and opting in for the 1 year FREE SAFRA Club Membership, do take note that during registration for the NS45 Vouchers, you have the option to use part of your vouchers for a 2 year membership too! All SAFRA membership expires on 31st March of every year, regardless of the join date. Membership is renewed automatically each financial year between 1st April and 31st March, regardless of whether the member uses SAFRA facilities / benefits. To opt out, the member must submit a withdrawal before 1st April of that year! But, why would you want to opt out of the SAFRA Club membership? 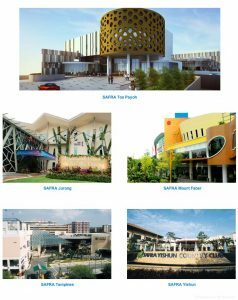 SAFRA Clubhouses are conveniently located at Jurong, Mount Faber, Tampines, Yishun, and Toa Payoh. The newly S$52 million revamped Toa Payoh Clubhouse, attracted more than 100,000 visits since its soft launch in October 2012. The sixth clubhouse at Punggol, themed “a Family Lifestyle Resort” is slated for completion by 2016, serving young families living in the area. Formed in 1972, SAFRA’s goal was to aid the Singapore Armed Forces (SAF) to strengthen the bondings and boost morale among National Servicemen. Other than the usual clubhouse facilities like swimming pools, gyms, food & beverages and entertainment facilities for you and your families and friends to strenghten your bonds or to make new friends, you can also find specialised facilities such as the Photography Dark Room Studio (at SAFRA Mount Faber), where there are 13 Enlargers, Computers and Scanners for Colour as well as Black-and-White processing and printing. And you can also find an indoor Photo Studio exclusively available for SAFRA Photographic Club members! You can also find SAFRA Exclusive, such as the Free entries for SAFRA members and their guests to St James Power Station, Singapore’s largest one-stop nightlife complex, and Exclusive packages and rebates with AsiaTravel.com. Further details for SAFRA Exclusive Promotions here. And did you know that there are Slot machine rooms, called The Winners Circle, at the SAFRA Clubhouse too? With No S$100 daily entrance fees, and you can even bring with you two signed-in guests to try your luck at the slot machines and Win Cash Prizes!! Find Out More About The Winners Circle and their operating hours here. 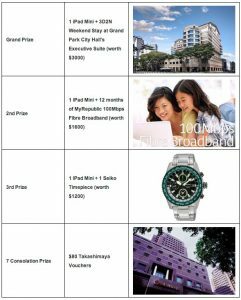 For New Sign-Up or Renewal SAFRA Members (before 31st March 2013), there is also a Quarterly Lucky Draw with a Grand Prize of an iPad mini + 3D 2N Weekend Stay at Grand Park City Hall’s Executive Suites (worth S$3000), amongst other prizes to be won. Check Out The Details for the SAFRA Quarterly Lucky Draw here. So, Do Not Hesitate! Join the (more than) 220,000 others and Be a SAFRA member Today !! !